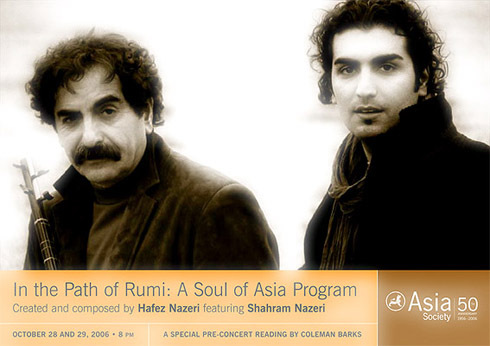 In this project composed and created by Hafez Nazeri, Persian music icon Shahram Nazeri joins his son and the Rumi Ensemble (Dave Eggar/cello, Liuh Wen Ting/viola, Pejmon Hadadi/daf and dammam, and Shane Shanahan/Indian and world percussion). In the Path of Rumi integrates classical Iranian and Western musical tradition, this transformation of classical Persian music into an evolved form promises a future of its own. Celebrating next year’s 800th birthday of Rumi, this concert launches the Sufi Traditions and Music: New Interpretations of Transcendent Vision series. Renowned poet and Rumi interpreter Coleman Barks gives a reading preceding the concert.